Pray all 15 Petitions of the JESUS PSALTER here Muslim Lawmaker Says Prayer in Name of Jesus is Islamophobic Pennsylvania’s first female Muslim lawmaker in the General Assembly accused a Republican colleague of Islamophobia after she opened a legislative session with a prayer that invoked the name of Jesus Christ. Borowicz delivered the prayer shortly before Movita Johnson-Harrell — the first Muslim woman elected to the General Assembly — was sworn in. POPE FRANCIS MOROCCO DOOM! Will Pope Francis Be The First Pope To Die In A Plane Crash? 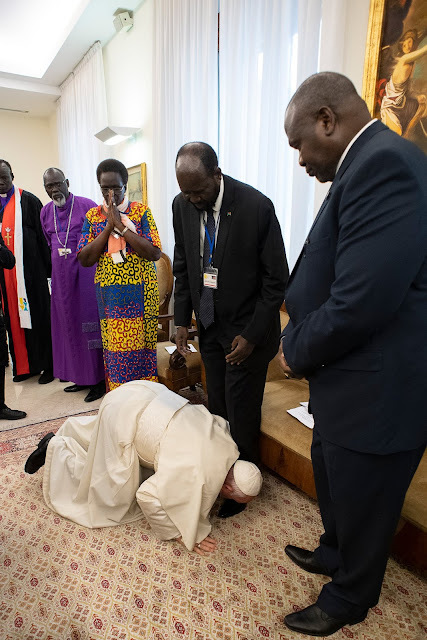 Pope Francis Fell To His Knees, Kissing The Feet Of South Sudan’s Civil Authorities! WHAT? Master: Let us assume that someone accuses another before the pope of being a heretic because the accused supposedly holds and asserts that the Christian faith is false, that the law of the Muslims should be embraced, and that Christ was a prophet both false and discredited. After the accusation and the ensuing judicial process, the pope renders a definitive judgement to the effect that the person accused is not a heretic because all of the aforementioned theses stated and asserted by him are true.